I’m Strat Mastoris, a photographer based in Brighton. The photograph above, though, is of the Canal Grande in Trieste. It’s there because it illustrates a number of the themes of this website, and of my photography in general. I love travel – the experience of seeing different cultures close up. Over the years I’ve taken photographs as far afield as Mumbai and New York – for travel company brochures and newspaper articles, and also to record my exposure to the different, the unusual and sometimes the downright bizarre. I’m also fascinated by history – if we don’t have some idea of how people lived in the last century, or the century before that, then it’s very hard to make sense of what’s going on in the world at present. 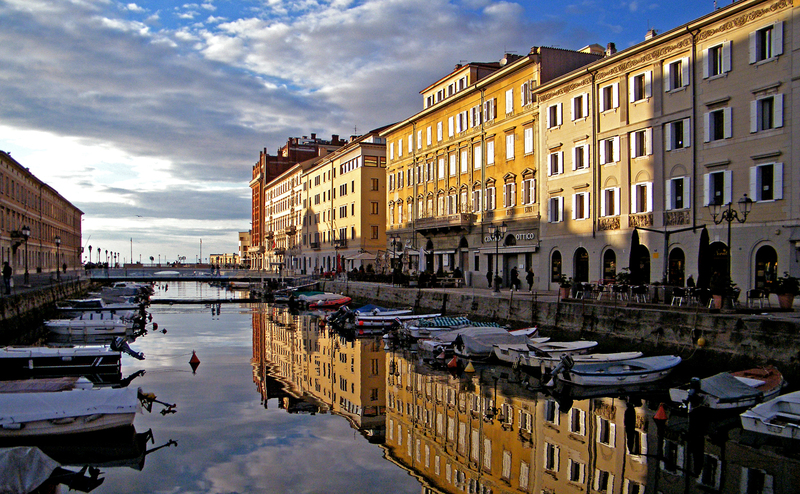 Trieste was the main port of Austria-Hungary, an access to the Adriatic for that landlocked empire in central Europe. Austria-Hungary, whose attack on Serbia started the First World War which brought the modern world into being. Archduke Franz Ferdinand’s body was brought back from Sarajevo by warship after his assassination and landed just along the Trieste waterfront from this picture. But I’m interested in architecture too. Empress Maria Theresa ordered the excavation of the Canal in the eighteenth century, and she encouraged the development of the imposing buildings and squares which surround it. I’ve worked as a civil engineer (a long time ago) so I understand how buildings are designed, and I’ve photographed many sites: new and classic, urban and rural. How the sunlight moves across a building is a critical factor in its design, of course, and as a photographer I’m constantly aware of the interaction of light and form. I’m not a ‘fine artist’, so most of my photographs are taken to communicate some quality of a product or service that my client is trying to promote. I use light to bring out the mass, or texture, or shape of an object, or to locate it in its surroundings to the best advantage. That might entail setting up complex lighting in a studio, or it might mean waiting six hours for the fifteen minute period when the shadows over the canal are just right – luckily they do very good coffee in Trieste. The basic principles of lighting are universal, so I’ve been able to use them in my work as a lighting designer with a number of fringe theatre companies. I’ve won awards for that activity, and using photography I’ve been able to record the productions for press and publicity material as well as the theatres’ own archives. I’ll come clean – I’m actually interested in most things, and I try to bring that enthusiasm, that sense of wonder, to the work I do for my clients and associates. I studied sciences at school, and I understand enough astronomy to be have been able to record the Transit of Venus, a very rare event. But I also love literature, and one reason for visiting Trieste was because James Joyce wrote much of ‘Ulysses’ while living in the city and teaching English. Oh – and I got engaged there . . .